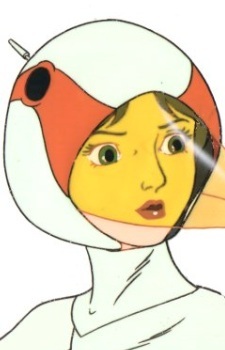 Jun "The Swan, Princess, Agatha"
By 1970's Japanese standards, Jun is a "modern gal," strong willed and independent. She's the Team's technical expert, specializing in explosives and computer hacking. Jun has a crush on Ken, but also seems attracted to Joe (this is more obvious in Gatchaman II). She considers the other members of the team to be her family—especially Jinpei, who she found as an infant and adopted. Cover Occupation: Runs a bar/disco/coffee shop called the "Snack Jun." Sometimes works as a "go-go dancer" at her bar or other nightclubs. Plays guitar in a small band.